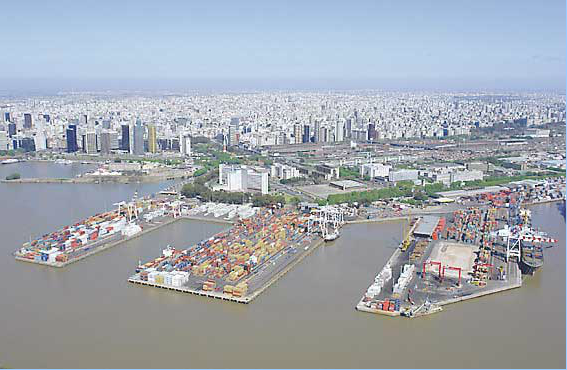 Operators: TRP: Terminales Río de la Plata (DP World, Latin American Infrastructure Fund and a number of international partners). Concession: 25 years as from November 1994. Extent: All Basin A, Pierhead No. 2, Basin B , Pierhead number 3, Basin C southside, plus area immediately west of berths. Total quay line of 2,400 meters and 43 hectares. Entrance: Via Ave. Quartino with forecourt parking for 110 trucks. Exit: Via Av. De los Inmigrantes: Gates: 7. 2×750 m of track including 150 m transference area. Length. 365 m. Quay for container, passenger vessels and general cargo operations. Depth alongside 9,45-10 m at datum. Cranes 1×35/40 ton Quayside Gantry crane (not operative). 4 quayside Gantry (Container) cranes 3×45 ton, plus 1×35 ton (not operative). Depth alongside: 9,40-9,60 m at datum. 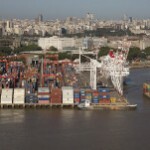 Cranes: Nil Berth reserved for transshipment barge, feeder services. Depth alongside: 9,70 m at datum. Basin C Southside: Length: 680 m (3 berths). Quay for container operations and berth for cruise ships. Depth alongside:9,70 m at datum. Cranes 1 super post-panamax container gantry crane, outreach 50 m, 66 ton; 2 P125L super Liebherr 50/60 ton SWL container gantry cranes, outreach 38 metres, hoist capacity containers 50 ton (Can lift 2x20x25 ton containers simultaneously) or 60 ton under hook with 35 m outreach. 1x post-panamax 66/65 Gantry Crane. Reconditioned and repaved to a high standard continues to be carried out. Pier No. 2: CY/CSA. 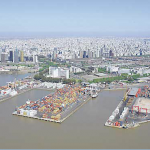 7364 ground slots (TEUS full containers) alongside and adjacent areas; also 3 hectares storage area for abt. 3400 TEUS empty containers. DELIVERY/RECEPTION OF FCL´S AND LCL´S. Bonded area as well as storage for break bulk cargoes and vehicles. Covered area for reception general cargo and/or cars. CD facilities as required available at terminal. GCSA: 12.500 sqm for general cargo. Terminal fully computerized, Navis-SPARCS system for ships-terminal planning and NAVIS EXPRESS in service. Radio Data Link (LXE) connecting operations office directly with yard personnel. Direct Maria Customs link. Complete stock principal makes maintained on premises. Terminal delivery and reception hours include week-day till 2200 hrs and Saturday as normal working time for handling containers in and out. Named “Benito Quinquela Martín” (famous painter of port scenes). Passengers/luggage are shuttled by bus/truck back and forth some 300 meters from the berth to the dedicated passenger terminal which includes all standard modern facilities in its 14.786 covered sqm.